Do these scenarios sound familiar? If it’s something you’ve experienced, I empathize. I am Indian. From the Caribbean. Specifically, I’m West Indian with East Indian roots. These are my parents. Overprotective, overbearing, strict, traditional, conservative. 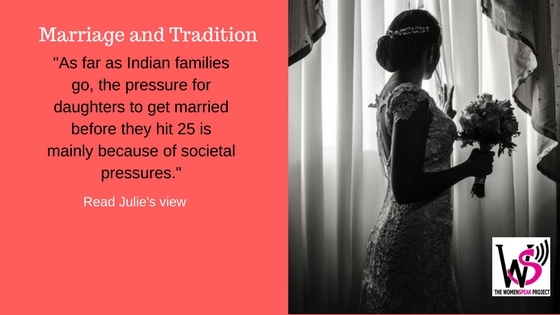 I know as far as Indian families go, the pressure for daughters to get married before they hit 25 is mainly because of societal pressures. Indian parents seem to care a lot about what society thinks. It is seen as something shameful to have a daughter who is over 25 and not yet married. And even to this day, this line of thinking still exists. I suppose tradition is hard to let go of. Personally, I have been dealing with that harassment from my mother recently. She often asks about when I plan to get married. I’m only 25. All I can say is, “not any time soon.” But she wants to know when. She wants to plan the wedding. She wants to save up for décor and food. I can understand for her (and many other parents), I’m the only daughter. In this culture, weddings are kind of a big deal. Not marriage. Weddings. I’m sure you’ve all heard of the fantastical Indian wedding. It lasts for weeks, almost. There are countless events, ceremonies, and rituals. It’s a big party for everyone. Not to mention, it is incredibly stressful for anyone involved in planning it. But it is tradition. And so my mother hopes I can tell her from now, so that she can save up enough by then to throw me a huge wedding. Because that is what this is all about. Weddings, marriages, babies. These things follow a strict tradition of – finish school, get a job, get married, make babies. 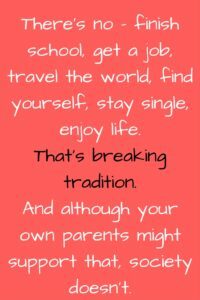 There’s no – finish school, get a job, travel the world, find yourself, stay single, enjoy life. That’s breaking tradition. And although your own parents might support that, society doesn’t. So those parents who don’t want to ‘look bad’ might pressure you into following tradition. I assure you, they do it out of love. They just want what’s best for you. And that’s what they know as being “best”. They mean well. So the next time you hear this from your parents, tell them how you feel. And if that doesn’t work, then just play along like I did, and give them a random number. “In 5 years, mom.” When 5 years gets here, who knows? I might just say it again. Do you think young women are still pressured to get married? 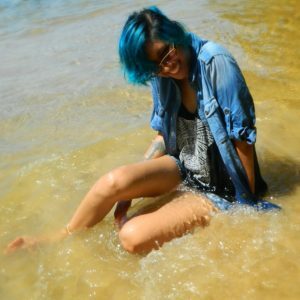 What does society value more: tradition vs. women’s autonomy? Tell us what you think. Next What Was She Wearing?